Welcome to the creative space! This is where you can find out how I create the projects that I enjoy and share tips on how you can make them too! Making things has been a passion of mine for most of my life, so this section of my site is dedicated to lots of tips, hints, as well as many examples on how I make my cute costumes and projects! One thing to keep in mind while creating your own projects is to be as resourceful as possible! While I may have used one particular item, product, or technique in creating a costume or item -- if you find something similar for less cost, or found a different way -- share that information with others! You may find something better, or a different technique, and it will only develop innovation. I highly encourage you to share your ideas and experiences with others because it fosters further knowledge and innovation. I have a lot of content available on my tutorial site! Make good use of it by utilizing the "Search" tool and discover new guides or info that you maybe haven't noticed before! This search also includes content that I may have reblogged from other artists, too! Enjoy! Costuming, cosplay, dressing up, fursuiting, whatever you consider it to be. I think its really cute innocent fun, and I love maskmaking and creating costume items. It has been my hobby for well over 15 years now and I really enjoy seeing what others create too! The process surrounding creating things such as fursuits is called prototyping, it is a perfectly natural part of the learning curve to learn to make new items by making rough versions and refining them as you gain skill and learn new techniques. Practice new techniques on scraps before applying to your final project, and most importantly don't stop trying!! Even if something doesn't work out as you expect, it is still a learning experience! It is for sure more fun to have a costume than it is to not have a costume, so have fun with what you make! I have collected lists of many useful things that relate to fursuit and costume building, crafting, including supplies! I sincerely hope these resources help you in your craft endeavors! In the resources links you will find in this section include faux fur suppliers, foam suppliers, and links to other tutorials and guides by other artists. A full list of resources for other tutorials and supplies, including fur and foam. A handful of tutorials that have been made available for sale in a printable format. Including highly specific and detailed information or patterns that you can follow. A pattern for a comfortable set of plantigrade footpaws with a liner. It includes a detailed tutorial for making and sewing the footpaws and liner with step-by-step instructions. This guide shows you the process of making a small maquette to prototype a sewing pattern from. This tutorial demonstrates footpaws, but it can literally be anything you dream up! Imagine plush figures, handpaws, tails, bodies, etc. Learn in detail how to make lined and stuffed footpaws with both indoor or outdoor finishing! Includes a tutorial with step-by-step instructions and a pattern for a footpaw liner. A clever way to create claws that retract like a cat's paw, pushing them out with the wearer's fingers and using elastic to pull them back in. Pattern for how to sew just the retractable claw assembly, the rest of the paw is up to you! Level up your zipper techniques and create beautifully finished and well-hidden zippers in faux fur! Utilize large-toothed zippers that can be hidden completely in the fur with a durable flap that helps keep the fur out of the zipper track. My go-to technique for building the head of a fursuit costume. The process of making a pattern with tape and applying fur to a foam shape. See also: "How to Pattern Objects with Tape" below in the detailing & finishing category. Information about foam vs balaclava based fursuit heads and the planning process that goes into it. A detailed guide on different ways to make and attach fursuit noses. A technique to make the neck cowl to bridge the gap between your head and shoulders. Video guide on patterning a resin-based fursuit head, To allow jaw movement. A tip on pushing expression for your characters. Need nostrils on your sniffer? This design will help you create some for a sewn nose. You may need to hide the fur edge against places like noses, eyes, and lips, here's how to do it. Position your ears like a pro, get the curve and support you need for your ears. Finishing tips for creating a beak for critters that need one! Detailed tutorial on finishing the interior and the mouth of a foam head with sewn teeth and a soft liner. A video guide showing useful techniques for working with foam demonstrated using a razor, spring scissors, and normal scissors. Four adhesives are tested to discover what will work best to glue a lycra liner to upholstery foam. My results and thoughts on them each are shared in this video! If you're unsure of what to use, do a test like this example! You might be surprised at the results you discover! Learn to make a body by starting with a store-bought pattern, edit and fit the "test fabric" custom to yourself, as well as planning and installing a zipper. Are digitigrade, unguligrade, or padded plantigrade body features planned in your costume? Learn how to make a custom shaped padded body in this guide. A guide on adding a simple zipper that is compatible with faux fur. A great place to get started, plan and execute a tail with some careful observation and this guide. Creating a zip-on tail and the planning involved for a smooth transition. So you want a body-double for tailoring yourself or others? Here's how to make use of a DTD in a detailed guide. Set-in or Raglan Sleeves: What's The Difference? A body needs a sleeve, this discusses what kind of fit you could get for your shoulder and underarms. Zippers can be used all over the place in your projects, learn how to make the end neat & tidy with a bit of matching fabric and no glue. Step-by-step photo guide to make a set of 5-digit handpaws. Letter and A4 patterns included! Utilizing a shoe as a base, this guides you through turning shoes into a cute set of footpaws. The most up-to-date guide on how to decorate paws with paw pads using an applique sewing technique. A video guide on sculpting claws with oven-bake clay. A video suppliment to the above visual gudie, some techniques have been updated and are noted in the visual guide. A clever way to create claws that retract like a cat's paw, pushing them out with the wearer's fingers and using elastic to pull them back in. This just shows the design, if you need a pattern I have it available here. Video tutorial on creating sewn claws, but also useful for sewing teeth and spikes, too! Image-guide for hand sewing in soft claws! Protect the bottoms of your detailed paw pads with a fun accessory that looks like scaled-up sandals. Treating a liner layer as one with the rest of the pattern when you assemble your handpaws can make a great luxury touch. A mini-tutorial on how to make edits to applique in case of a mistake. There are many types of fabric available, check out this visual aid i made to help you choose fabric to use for sewn claws! Learn how to make long fur short in this useful guide! A video tutorial demonstrated on a small plush, showing how to shave faux fur on an already shaped piece. Is it hot in there? It doesn't have to be with a fan. Assemble a computer fan and a 9 volt battery. Paint and blend markings in fur with this technique that simulates the look of airbrushing without special tools. One of my favorite touches! Add whiskers for the ultimate cute finishing detail. With an included video guide! Video guide on sewing wide bias tape. Useful on cuffs, necklines, and anywhere you don't want an edge to stretch. A visual + video guide on utilizing the narrow style, single fold, bias tape. How to Sew Bias Tape so the Edge is Hidden! Visual guide useful for the kind of fabrics that may unravel in places you do not want your bias tape to show. A premium combination to prepare lycra for use on areas you want the shine of lycra but need it to be easier to sew. Video tutorial for how to make a pattern out of a full-size model using tape and paper. Useful for making dynamic pattern shapes for anything, costumes, plush, etc. Use a felting needle to install small perminant markings and dots in faux fur. Shaving Shag Down or Using Short Fur: What's better? Should I shave? Should I buy short fur? It depends on these factors. Blend those overlapping edges by brushing them out to reduce a hard line appearance. Video guide on a different seam style, to better hide where two pieces of shortpile fur fabric connect to one another. Tips on utilizing an airbrush to paint color on faux fur. This is a video demonstration of how to sew a small spot with a sewing machine. Tips on lining up markings across seams to get good results every time. Is it common to line fursuit parts? I share some photo examples and explain what fabrics are utilized! Additionally I also clarify the difference between lining and edge finishing. Several links to videos of hand-sewing examples. How Much Fur Do I Need? The #1 question I get, the steps involved with making your pattern and measuring it to know how much to buy. Many questions I have tagged with #faq so they are in an easy to find place! If pinning is cumbersome, try basting. Large stitches utilized in a similar way as pinning. What is Safe For Marking on Faux Fur when Fursuit Making? An important test to try yourself before using an untested marking pen. What to look for when buying swatches and choosing fur. Swatches are a very important 1st step to buying fur online. How to examine swatches to decide if they will work on your project! You created or purchased an amazing costume, how do you keep it nice? Here is some information on that very topic! Testing gives us confidence, so I encourage everyone to use scraps of fur test these maintenance methods so you can see the results and compare for yourself! Check out my #fursuit-maintenance tag on tumblr. 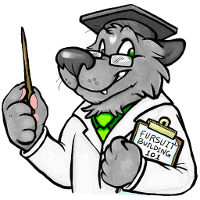 There is a lot of hearsay when it comes to maintaining fursuits, you can find out what works and what doesn't by using scientific method-style experiments to see results for yourself! Cut up a few swatches of scrap fur and save one piece aside as a "control" and test the remaining pieces to your heart's content! What results do you get? Is it what you expected? Share your results! Covering spot cleaning, washing, drying, washing fursuit heads, faux fur care, replacement parts, between-wash care and a list of supplies. Learn to use heat in a controlled way to straighten fur that has been crimped by improper storage or with use. With an included video guide! Perminantly change the texture of Mongolian type faux fur with this technique. Controlled heat using a handheld hairdrier can restore the texture of faux fur that needs repair. Visual guide on making a small patch and sewing it in place to repair a hole in faux fur. Using darning as a technique to close up holes in faux fur's backing. Make the stuffing in flat tails and plushies soft and fluffy again with this technique, visual & video guide. A good practice after wearing your fursuit parts, but before putting them away. Got a little spot on your costume that needs cleaned up? Check out this tutorial in english or spanish. Info on what tools to use, and other tricks to refurbishing heads. Oh no! A drip!!! You can get it out, don't worry! For Vinyl Decals, Balaclavas, & Fursuit collars that I sell online or at events. Fursuits aren't the only thing I am a fan of creating, some guides on making some other goodies to enhance your furry experience! What makes a good prop, exploring prop themes, clothing as a prop, and other aspects of prop creation and use. A pattern and tutorial for making your own ears with just faux fur and a few extra notions. Utilize shrink plastic to make a cute prop nametag for your character. The ultimate addition to any pair of socks. A really fun craft for anyone! A step-by-step illustrated guide to fold your own origami foxes. A pattern collaboration with a friend, This pattern will create a 25-inch plushie with anthropomorphic-style proportions. Demonstrates making a case for a head, but is also suitable for any object (such as footpaws, props, etc.) that you want to cover for travel or protection. Create comfortable and cozy cuffs with a thumbhole to add to your kigurumi project, favorite sweatshirt, or other wearable items! Here is how I construct fursuit bandannas! This is an especially great way to practice using a sewing machine if you are new at it. Techniques that can be utilized to make ANY interesting see-through prop using vinyl. I love recipes and have decided to share some of my own! Some are edible, some are just useful things! Enjoy! Check out my #recipe tag on tumblr. A super simple dessert that can be made with fresh or frozen fruit. An iced mocha made with 2 kinds of chocolate. Want your character to have its own signature fragrance? Make a simple spray with disinfecting qualities. These are articles about fursuit-related topics without them specifically being a tutorial. My goal is to be informative or thought-provoking in the process. I hope these, and future articles, serve to be both good information to help folks think about the how's and why's of fursuit topics, but also offer a helpful or informative detail about the topic at hand (ok, ok, some how-to stuff might still be included). Check out my #articles tag on tumblr. Timing yourself is one of the most important steps you can take to figuring out how to price creative works. What can certain subtleties do to make a character "read" or "feel" a certain way such as masculine, feminine, or neutral? How to push that in your designs. A thoughtful article discussing details on characters that may only ever be present on the fursuit version of it, not in the art, certainly not on an animal it is based on! Have you wondered why its like that? Want to get a sewing machine just for making a fursuit? This article outlines what to look for, as well as how to actually use a sewing machine on fur, what needles to get, and other important usage information. A collection of tips on what to include in your auction post, where to get the information it needs, picture taking and advertising tips, and important logistics of the sales and mailing process. Your online image, pricing, and who to consider advice from when starting out. Deciding your limits, exploring sales tactics, keeping your leverage for refunds, and advertising tips. Marketing yourself by breaking away from tired buzzwords and coming up with ways to elevate your highly creative custom luxury items. Are you interested in or looking for a community to share your creative progress and stay inspired? I operate a dedicated-topic chat called The WIP Zone on a service called Telegram. 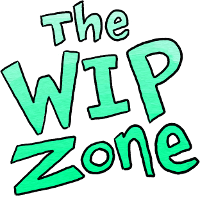 The WIP Zone is a wonderful inspiring place with a dedicated theme of sharing WIPs and staying inspired. All kinds of safe for work artwork, fursuit, sewn, crafted or other projects are welcome to be shared there.